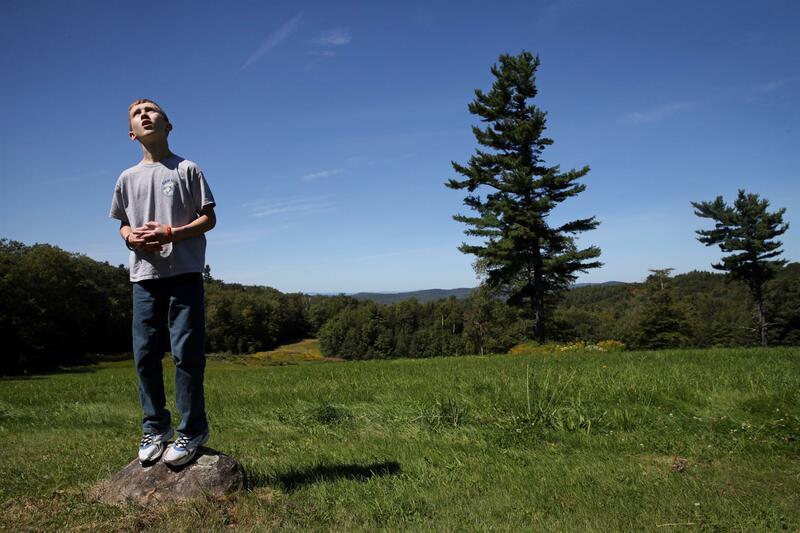 Connor Biscan stood atop a small rock and searched the sky for the balloons he had lost at a family gathering in Nelson, N.H., on Labor Day weekend. 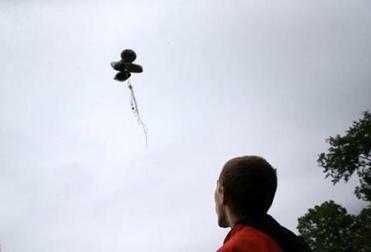 Connor had flown the balloons in an open field behind his great-grandfather’s house. When the kite string broke and the balloons snagged on a tree, he became anxious. His mother, Roberta Biscan, praised him for remaining calm. As a baby, his first word was balloon. He is a boy easy to love, and also a heart-testing puzzle to those who love him. He longs for home, but home has become somewhere hard to thrive. And yet, beset by autism and other issues, aided by family and teachers, Connor Biscan is learning to rise. This time he had to go. There was no time to think about where. Connor Biscan was biking along the driveway of the group residence for boys where he lived when he realized what he needed to do. He’d noticed something tangled in the branches of a tree: A deflated balloon. It spoke to his heart. Connor adored balloons and always had. There was no explaining it and no need: They just made him feel happy, and comforted. At home he could have as many as he wanted — or at least it felt that way. Here, at the house the 13-year-old shared with eight other boys with needs like his, balloons were forbidden. A choking hazard. Enough. Connor felt a familiar electric surge of anger and began to pedal furiously. He quickly outpaced the teachers who sprinted after him, and rode out of the residential Hopkinton neighborhood into the August evening. Taking a right on busy Route 85, he passed gas stations and restaurants, cemeteries and woods, riding in the road when the sidewalk ran out. Only as the sun began to sink, did he pause. He didn’t really want to be out in the dark. It was time to turn back. But by then Connor Biscan was lost. He is easy to love, affectionate, and friendly. He is moody and unpredictable. Impulsive, strong, and overflowing with emotion. This is Connor, a puzzle his family and caregivers have worked long and hard to solve, a boy who lives at the intersection of autism and mental illness. It isn’t so much a rare place — as many as half of autistic children suffer from mental health problems — but it can be a deeply baffling one. The overlap between these afflictions is hard to untangle; diagnosis and treatment can be very difficult. And a health care system meant to help can instead be frustrating, even harsh. Connor’s family gave a Boston Globe reporter and photographer rare access into his world and their struggles, believing it might help other families if the reality of caring for children like him were more broadly seen and understood. Connor yelled at his mother, Roberta, as they returned from an excursion during a family gathering in in Nelson, N.H. Connor had shouted an expletive at his sister, resulting in his first warning from his mother for the weekend. Ten warnings and Connor has to return to school. He begged his mother to take it back. “Take it back, please take it back,” he screamed in his mother’s ear. Connor’s cousin, Kara Quinn, 8, was at left. Over the years, they have tried everything to help him. Often, in his young life, the least suitable option seemed the only one. Three years ago, Connor spent eight long days in a windowless emergency department room at Newton-Wellesley Hospital. He was in crisis, possibly hallucinating, and needed admission to a psychiatric hospital, but there were no beds free — nothing unusual in a state that faces a chronic shortage, especially for complicated cases. 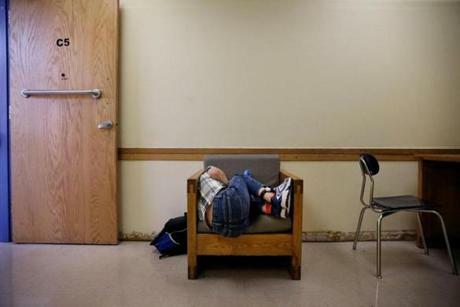 There were then just 121 psychiatric beds in Massachusetts for children; today, there are 135. Roberta said goodnight to Connor after his 13th birthday party. 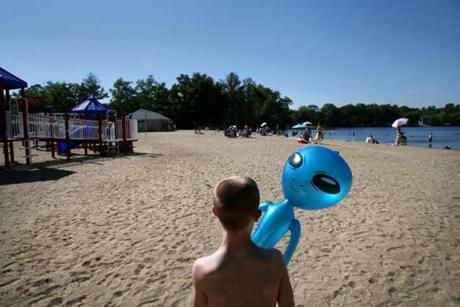 Earlier, he had a conversation with an imaginary friend of sorts about why he couldn’t move back home. “You’ve been too unsafe,’’ he said. “You could really hurt Mom.’’ But later, in bed, Connor told his mother he really wanted to come home. It’s a familiar conversation. “I tell him that it’s not safe for anyone right now, including him, but when it is, he can come home,” she said. Or, perhaps, there was a bed free that day, but no hospital wanted to take a child who would clearly require major resources. It happens more often than anyone wants to admit. The emergency room was no substitute for specialized care; Connor’s family felt the doctors and nurses, while well-meaning, lacked the time and expertise to care for him. The ER staff didn’t disagree. This was no place for a distressed child to spend a week. Everyone knew it. 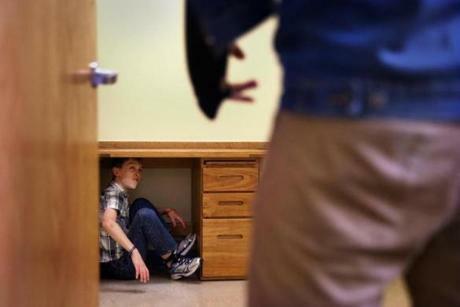 Connor had been sent there after he’d spun out of control at the Walker, a school in Needham, which offers academic instruction and a crisis treatment program for children with special needs. Convinced two classmates were teasing him, he exploded, hitting staff, spitting, banging his head against the wall. He was being weaned off his antipsychotic medicine at the time; there was nothing to calm him. Over four hours, he was restrained 13 times. There was another worry: Connor had a history of talking to imaginary friends and even to objects like trees and lamps, and these conversations were growing more frequent. Arriving at Newton-Wellesley Hospital after midnight, he began those eight lonely, baffling days. There were no windows. No baths. No going outside. A security guard stood at the door. He watched television and videos most of the time, and family visited. Connor grew anxious and upset as his mother tried to fix the drone he received on Christmas morning. Connor is easily frustrated, and even fleeting annoyances can explode into anger. Overall, he said, he had a good Christmas. Connor sat at the long wooden table in his mother’s kitchen, his knees pulled up under his chin. Almost two years had passed since his long emergency room ordeal, and still the memories pursued him. “I wouldn’t take you back there, I promise,’’ Roberta Biscan replied. “Nope, I wouldn’t let the ambulance take you back there either,’’ she affirmed. Connor was the first grandchild on both sides of his family, and with that came special status. There were sleepovers at the homes of his mom’s two younger sisters, Shawna Bickford and Danielle Quinn. Dinners at Floramo’s Restaurant in Chelsea where the adorable blond baby in the high chair took turns trying all the adults’ entrees. Trips to Laconia, N.H., where his father’s parents owned a condo. When visiting his paternal grandmother, Donna Biscan, Connor would jump at the chance to go to Mass. The music and ritual enchanted him, and drew out his natural compassion. One Sunday, he spotted a little girl who was suffering from a disfiguring medical condition. Connor’s eyes filled with tears. When the priest called on the congregation to exchange a sign of peace, Connor darted out of the pew, ran to the front of the church, crawled across laps, and hugged her. But there was another side of Connor, and always has been. Roberta Biscan knew early on that something was wrong. As a toddler, Connor didn’t talk much or make eye contact. He had obsessions and private rituals — counting ceiling fan blades in his Aunt Shawna’s house, opening gas tank covers on cars parked at family cookouts, and, of course, balloons. It had been his first word — balloon. Roberta had taken him for an evaluation when he was 2, even though her mother thought she was overreacting. Connor was diagnosed with “pervasive developmental disorder’’ — the multifaceted and heartbreaking manifestation of abnormal brain development we know as autism — and entered a special education preschool class in the Wilmington public schools. He made progress and seemed to thrive on the classroom routine, but his mother was constantly battling the school system for services. Over the next few years his behavior problems began to fully emerge and deepen, as they often do as children like him mature. He could not take no for an answer. He would get extremely silly and then, almost always, aggressive. His confusing conversations with no one in particular had grown more insistent, especially those with an imaginary friend whose name is also Connor. “He is stuck in my head. There is no way to get him out. No way,’’ the boy explained. Doctors diagnosed a mood disorder on top of the autism, but clarity about his case was elusive. At different points, Connor also has been diagnosed with bipolar disorder, anxiety, sensory processing disorder, and ADHD. His conversations with himself have been called a sign of psychosis and also a healthy way for him to work through problems or confusion on his own. Is his unpredictable anger due to frustration over his autism? Or is it a completely separate disorder? For kids with overlapping symptoms it can be hard to tell. In third grade, things began to fall apart. After he spun out of control once too often, the public schools would not accept him back, his mother said, and he was at home, out of school, for five months until a spot opened at the Walker, in Needham. By then, his parents had divorced, and Connor spent every other weekend with his father, Billy Biscan. 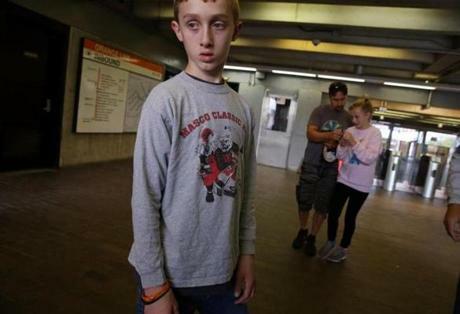 Connor waited for his father, Billy Biscan, and his sister at the Wellington train station in Medford. The family traveled to Boston Common for the Autism Speaks Walk, a fund-raising event. When Connor was first diagnosed with the condition, his father didn’t believe it – or didn’t want to. “I thought he was a little different. Then school was a disaster for Connor,’’ Billy said. He said Connor is not what people typically think of when they think of autism; he makes eye contact, he carries a conversation, and he is coordinated. “He’s in a good stretch right now. I tell him if you want to come home you have to be safe at school and you have to be safe at home,” he said. Connor’s twin siblings, Will and Ayla, who are two years younger, couldn’t have friends over. Will was diagnosed with anxiety; he shared a room with Connor, whose noisy struggles to fall asleep kept Will up. Ayla secretly made a behavior chart to try to help her older brother — an adult task her mother felt should not be her burden. Family parties became about keeping Connor calm as much as about celebrating birthdays and holidays. There were tense discussions between his mother and her youngest sister, Danielle Quinn, about whether Connor should be allowed to play with Quinn’s daughter, whose hair he continually yanked. “We had some rough moments,’’ Quinn said. She privately wondered if Connor could control his behavior, but eventually realized that he could not. It was time to consider a residential school. To send Connor away. It was a decision that cleaved the family. Connor’s father was adamantly opposed and fought the move. Connor’s behavior was often better with him, so he took the boy to live with him and unsuccessfully sued for full custody. “Just the thought of him being brought up through strangers . . . It broke my heart,’’ Billy Biscan said. He recommended a residential facility. That helped settle the matter, and the family began visiting schools. Everyone wanted to make sure their Connor was well taken care of. 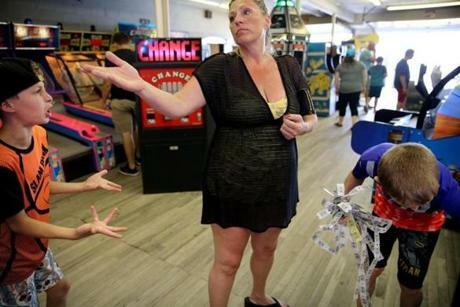 Will Biscan, 11, left, complained to his mother after she gave her winnings of 250 tickets to his brother, Connor, while visiting the Playland Arcade at Hampton Beach, N.H. Will, who used to share a bedroom with Connor, has struggled with his brother’s autism diagnosis. “Will feels that Connor gets a lot more than he does,’’ his mother said. On Nov. 28, 2016, Connor’s mother dropped him off at the Guild for Human Services in Waltham — one of three residential programs the Wilmington school system recommended. Roberta had heard positive reviews from another mom and it wasn’t too far from his parents’ homes. Finding a stable school situation for children with autism and mental illness can be incredibly hard and disheartening. Some children move from school to school, desperately trying to find a good fit — and one where the reality of care matches the marketing. At first, Connor adjusted well to the Guild. The Guild’s residential staff promised that Connor would be too busy out in the community, bowling, and visiting playgrounds to miss home. But to Roberta and Billy Biscan and their families, it seemed he was spending too much time on his iPad or watching television and not getting enough exercise. Once, when his roommate choked him, leaving angry red fingerprints, staff did not seem to Roberta to have sufficient answers about how it happened. “I could not go to sleep some nights thinking (of him),’’ his mother said. Connor was growing up fast. Time was outrunning the search for a place he could live and learn, safely and happily. On a cloudy day last May, Connor became a teenager — often a fraught transition for children with autism. It was his first family birthday party since he had moved out, and it didn’t start well. Connor soaked in the bathtub. He has been diagnosed with autism, a mood disorder, and attention deficit hyperactivity disorder. As many as half of children with autism also have a mental health disorder, and the combination makes treatment more complicated. Tall and slim, handsome and strong, Connor bounded out of his grandmother’s car holding four balloons. She had picked him up at school, and they had stopped at a store on the way home. He had chosen ones with colorful “happy graduation” message because, he reasoned, he was moving up to adolescence. Happily, he tied them to a kite string he found in his mom’s garage and flew them high above the soaring treetops. Connor’s aunts and uncle, cousins and grandfather arrived and he excitedly hugged each one. He tied the balloons to a grill and opened a card from his Aunt Danielle and Uncle Matt. $30. Connor shrieked with delight. Connor did the mental math. Balloons cost $1 at the dollar store. Thirty would be sweet. He asked his mom. She said that was too many; the Guild would not let him bring them back to school. “It’s my birthday and you are ruining it,’’ Connor screamed. Connor rested in his “sensory closet,’’ while his mother let in the dog at home. 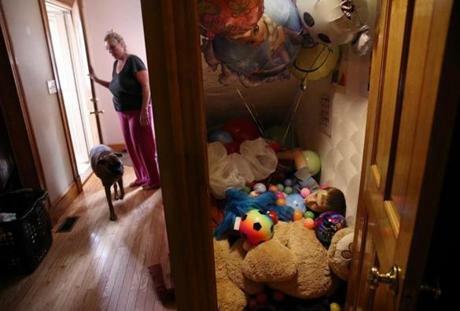 Roberta explained that Connor suffers from sensory processing disorder, meaning “he doesn’t know where his body is in space.” The closet under the stairs is filled with comforting objects: pillows, blankets, stuffed animals, toys, and balloons. He buries himself among his favorite things. Roberta said their weight signals his nervous system to calm down. “He can stay in there for hours,’’ she said. Roberta Biscan rushed inside to fetch a toy catalog to distract him. Connor grabbed it and crumbled it into a ball. She offered to play basketball with him. Connor slapped her arm before speeding away on his electric scooter, alternately laughing and swearing and threatening to crash and kill himself. Danielle Quinn went after him. For 20 minutes they sat in chairs by the fire pit, apart from the others. As Connor slumped in a lawn chair, she asked him to close his eyes and envision the things that made him happiest. It did the trick. He was still mad at his mom, but calm enough that the family could head inside for pizza and a chocolate ice cream cake with 14 candles — one for good luck. Connor became his best self again, charming his family with his pure joy over the sweets. His mom cut him the first piece. “I am really happy you pulled it together so we could get to the ice cream cake. Thank you,’’ his grandmother said, watching him eat. Roberta decompressed after putting Connor to bed. He would be moving into a new school later that week, and had yelled and sworn at her when she said balloons were not allowed there. Her family worries about the impact of Connor’s behavior on her. “She handled more than most people could ever handle,’’ said her sister, Shawna Bickford. “She was close to the breaking point’’ before Connor moved out. Now her stress level “is not at a 10 constantly. She is at five,’’ she said. Later that night, the guests gone, Connor changed into red pajama bottoms and sank into his mom’s deep brown sofa to reflect on the day. Coco, the family dog, rested her head on his lap. Despite his yearning to be home, Connor knew that he would be going back to school in the morning. “You still have to be safe and that’s not happening right now,’’ he said to himself, and promised to change. Roberta Biscan drove Connor back to the Guild the next morning. He cried and refused to get out of the car. Then on June 18, the New England Center for Children called to say it had a spot for Connor. This time, his mother thought, it had to work. Based at a campus 25 miles west of Boston, NECC prides itself on taking the most challenging autism cases in the world. The school’s influence reaches far — hundreds of schools use its curriculum. Parents can spend years fighting to get their public school systems to pay the $250,000 to $350,000 yearly tuition for NECC’s residential school, whose 130 students live in 17 group homes scattered through five suburbs. Connor’s trial visit to the school went well. He showed off his reading and math skills, behaved perfectly, and was beyond excited to tour the pool. Social and verbal — a master negotiator, really — he is one of the higher-functioning students. Connor played a video game in the leisure center at the New England Center for Children in Southborough. At the residential school for children with autism, even play time is an opportunity for adults to teach students social skills. Other schools may try a range of treatments, but NECC is wedded to applied behavior analysis, a patient but firm approach that breaks down desirable conduct into steps and rewards the child with something they badly want — like iPad time — for completing each one. It is an approach that has its critics, who think it too rigid, but here it seems often to work. On July 13, a Thursday, Roberta Biscan drove Connor to his new school. He would not be allowed to visit home for six weeks, a common rule at residential programs, meant to help the newcomer settle in. A video screen in the lobby showed a colorful kite and read “Welcome to NECC Connor!’’ “Cool,’’ he said. He and his mom snapped a selfie. Four employees descended the stairs to greet them. “You ready?’’ Roberta said to her son. “Yup,’’ Connor said with a big smile. Right from the start, Connor began asking to go home, but no one expected him to run. But then, about a month after he arrived, the balloon in a branch caught his eye. Center staff dialed 911 and local police officers spread out to search for the boy on the bike. No one knew where he was headed, so Hopkinton officers alerted four surrounding towns and State Police. A police helicopter searched from the air and a Milford officer began to scour the waters at the local quarry. His mother issued a frantic Facebook appeal for help. Hundreds of readers clicked the share button. Witnesses began to call in, allowing police to home in on his route. Two hours after Connor left, and 8 miles from his group home, an off-duty Milford police officer spotted Connor pedaling near the town center. 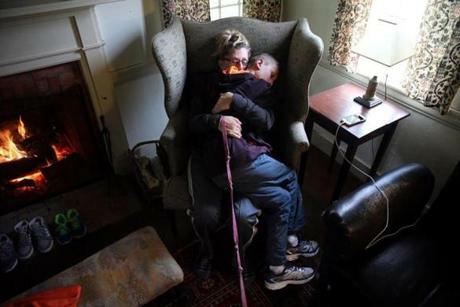 Roberta and Connor embraced while resting by the fire during a family gathering in Nelson, N.H. It had been a tough day. Connor struggles to manage his powerful reactions to disappointments, often taking out his anger on his mother. When Roberta Biscan arrived at the station with her sister, she hugged her eldest child tightly but tried not to give him too much attention. She did not want to encourage running away. The three of them were crying. “I love you, but never, ever do that again,’’ she told him. Everyone’s goal is the same: For Connor to return home. But no one has any idea how long that will take. Keeping him in a school is the first step, and not an easy one. On a hot sunny morning, five days after Connor’s escape and return, the boys in the house on Ursla Drive started the school day in the leisure center, where even playing video games is an opportunity for instruction. Then Connor headed to his classroom, a plain pale yellow room with an old desk and two chairs, where he worked alone. His teacher for the 11 o’clock hour was Kaitlyn Kuss. Teachers rotate students every hour or two in part so kids learn to respond to different people, and teachers get breaks from especially challenging students, Connor among them. Connor curled up to watch a video on his iPad in his classroom at the New England Center for Children. IPad time is a reward for good behavior. The school practices applied behavior analysis, breaking down desirable conduct into steps and rewarding children for completing each one. A buzzer sounded. “Can you move to your desk?’’ Kuss asked brightly. He did and she marked a check on a white laminated worksheet. “Can I have my DVD player back?’’ Connor said. Kuss replied that they were going to do a “little work’’ first. Applied behavior analysis starts small and moves slowly. First, teachers use rewards of iPad time to get Connor to ask politely for the device. He earns a check every time he cooperates with the teacher’s command. The demands gradually increase. He can trade in each check for two minutes of a chosen activity near the end of the school day. For Connor, it’s often screen time. In just a month, Connor has made progress. At first, he would have a tantrum if a teacher took his iPad and put it on the desk just feet away. Now, that’s no problem. But he’s still got a long way to go. By 11:30 a.m., he was curled up in a ball in the cushioned chair and didn’t move when the timer sounded. Kuss pleasantly asked him to sit at the desk, and he eventually complied, though he was obviously cranky about it. A month later, Ursla Drive was serene — at least from the outside. The morning sun lit up the majestic trees in the expansive front yard. Inside, Connor ate French toast sticks and gulped milk at the kitchen table. He placed his dishes in the dishwasher and then moved to the living room to watch a movie. There was something off about him that day; he didn’t greet visitors with his usual exuberance. When schoolwork began, Connor’s teacher Matt Souza began to erase the checks on Connor’s behavior chart with his sleeve. “Why are you erasing those checks?’’ Connor asked. Souza explained that they were yesterday’s. Connor scowled and walked out the door to his next class. Then, with no warning, he whipped around and swung at Souza, aiming for his mid-section. Souza, with the help of two other staffers, urgently pushed Connor back into his classroom and shut the door. They heard him pick up a chair and throw it. They opened the door slightly and Connor threw a chair in their direction. Connor curled up on the floor, under the desk. Souza started to head back in but Connor screamed at him so he retreated. Then he headed in again, with a new approach. As Connor cried under the desk, Souza explained that this day would be the first time he would see Connor swim. He was a varsity swimmer at Hartwick College in upstate New York, he told the boy. “Really?’’ Connor asked. He stood up and started to gather the school papers he’d thrown around the room. By December, Connor’s tolerance for schoolwork had grown — he could do a full hour now — as had his ability to withstand delays and denials. At the house, he was no longer always on a screen; he also made brownies and did laundry and other chores. The goals for Connor at this point are simple yet hard for him — move him into a classroom with other students and reduce his level of teacher supervision. Connor, too, was feeling good about himself on this Thursday. He had earned a trip to Toys R Us. He headed straight for the stuffed animal section, where he argued passionately for both a huge brown bear and a massive white unicorn. But he ended up with a small white and gray dog, a plaid Christmas ribbon around its neck. He was thrilled. At school, Connor’s good humor and loving side are often display. But there is also an underlying sadness that can break through unexpectedly. Connor had recently returned from Thanksgiving break — his longest stretch at home since entering NECC. It hadn’t been easy for him or for his mom; replicating the structured patterns of the center at home is just about impossible, and Connor sometimes turned aggressive in his frustration. His weekend overnights with his mother and siblings would be reduced from two nights to one. Navigating the routine at the center had come to seem easier. On that Thursday in November, the boys had gym class in the afternoon. They sat on scooters that they propelled with their feet, racing to navigate an obstacle course of cones while pushing a ball with foam hockey sticks. Connor walked the beach while visiting Silver Lake with his family in Wilmington. His mother suspected soon after Connor was born that something was wrong, but her family thought she was being dramatic. He had rituals, such as counting ceiling fan blades, and an obsession with balloons. He was diagnosed with autism at age 2. “He was my first grandchild and I saw nothing but perfection,’’ said his grandmother, Karen Francis. After his turn, Connor retreated to a low bench, pulled up his knees, put his head on his arms, and began to cry. Souza came to him. “I want to go home,’’ Connor mumbled. “You’ll be going home on the weekend, buddy,’’ Souza said gently. “I want to go home every day,’’ Connor said. Connor paused as if consulting his inner voice. His eyes wandered the room, and then he seemed to settle on a decision — one he could live with for now. He turned toward the game.